of Assistant Engineer (Civil), Assistant Engineer (Mechanical) jobs. Mode of application is online for these Jharkhand Assistant Engineer (Civil/Mechanical) Jobs in Water Resources Dept. Total available AE Mech/Civil jobs in Jharkhand JPSC Recruitment 2018 are 57. Last date for online application for these AE Mech/Civil jobs of Jharkhand JPSC is 29-10-2018. 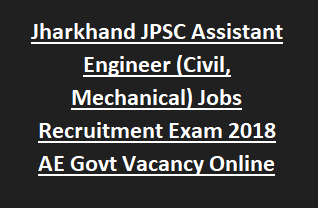 Candidates must have qualified Engineering Degree in Civil or Electrical stream for applying this AE Mech/Civil Jobs recruitment 2018 of Jharkhand JPSC. Candidates selection for this JPSC Assistant Engineer (Civil/Mechanical) Jobs Recruitment 2018 will be based on written exam only. More details of Jharkhand JPSC AE Mech/Civil Recruitment 2018 Notification No of posts, Exam Pattern and Syllabus, online application form and other details are given below. Probable age limits will be 18-35 years for Gen candidates. For OBC male upper age limit will be 37 years and for female OBC candidates 38 years. For SC/ST candidates of Jharkhand State Upper age limit is 40 years. Salary for AE Mech/Civil jobs is as per the norms of Jharkhand Govt Group B posts. A written exam will be conducted for candidates selection or this AE jobs in various departments of Jharkhand State. Candidates selection will based on objective type written exam only for this JPSC AE Vacancy. Exam Syllabus will cover the topics of Engineering Subject, General English/Hindi, Arithmetic & Reasoning and Current Affairs, General knowledge related to Jharkhand State. Candidates who are qualified engineer degree in Civil or Mechanical Stream they can apply online for this JPSC Assistant Engineer Jobs through official website of JPSC.gov.in. Last date for online form submission is 29-10-2018. After online form submission take a printout and attach the all required documents and send the copy of application form to JPSC on or before 12-11-2018.